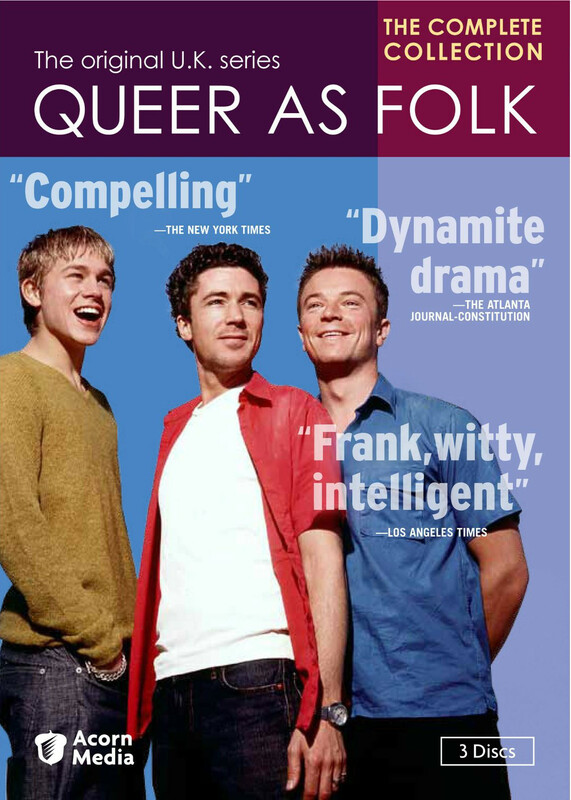 In line with June being LGBT Pride Month and all and since I needed something to write about, I finally sat down to watch the original UK run of Queer as Folk, the very same series that inspired the Showtime show of the same name. And while I thought I knew what to expect upon finally watching this show, the end result was very different from what I was familiar with. And that's a great thing. When watching the original Queer as Folk after having seen the US version, a lot will feel familiar. Forget all that - this is a British series that has drastically different sensibilities and overall timing. The first series was only 8 half-hour episodes while the second series only lasted for 2. That may not seem like enough time to tell a story from a Hollywood perspective, but in the UK it's just right. And I have to admit, the UK and US versions of this series are indeed entirely different shows. The stories and characters may have similarities, but the end results are certainly worlds apart. And that rather enriches the entire narrative for both shows in a rather significant way. Synopsis: Queer as Folk is a British LGBT television series capturing the gay life in Manchester. It was created by Russell T. Davies and across two series for a total of 10 episodes. Our protagonists in this tale include Stuart (Aidan Gillen), who is quite sexually promiscuous, Vinece (Craig Kelly), who is a major Doctor Who nerd and Stuart's closest thing to a best friend, and the rather young Nathan (Charlie Hunnam), who is brand spanking new to the whole gay world. And the show follows these characters both at the workplace and of course at their favorite hangouts along Canal Street. A lot of the initial plot points are the same. We have Nathan on his first night in the scene and managing to attract the attention of the older and much more confident Stuart. There's the mad scramble to the hospital to be there for the birth of Stuart's son born out of his sperm donated to lesbian friends. And all that cool stuff. But at the same time things are pretty different. I'm going to break my usual rule on comparing different adaptations of a work to one another since it's the easiest way for me to contextualize my experience of watching this show given how much of my gay life had been shaped by the US version of the show. There was the eerie feeling of things being out of phase or something like that despite familiar plot points and character personalities. And as you get through things, it'll be worth the overall pseudo strangeness of it all. Biggest shift - the drama is in the right place. The stories are focused, rather plot-driven with decent development for our three protagonists. This is not a larger ensemble piece that the US sort of became over time - they kept the cast pretty focused in that regard. And when I say the drama is in the right place, I mean that they don't have to much filler drama going on. Nathan as the young gay man isn't as annoying as his US counterpart. Sure, he still makes stupid decisions and he's prone to through little tantrums here and there. But he learns the rules of the street soon enough and he doesn't spend all of his time pining over Stuart. After getting burned a few times, he learns to become his own man, and that's great. And I bring this up right off the bat since the Brian-Justin relationship in the US QAF was one of the more annoying plots that became horribly central to the show. And yes, he was the lead in Pacific Rim. Totally. Stuart is still a self-assured, arrogant, and manipulative man who can get practically whatever he wants. At times the extent of his influence can be pretty scary, but we learn to understand a bit of why he is the way he is in the show. Plus there's actual merit to his way of dealing with the world, as evidenced by those odd instances with other friends approach Stuart for help with one delicate piece of business or another. At the end of the day he gets things done. But the real clever dynamic exists between Stuart and Vince and their odd friendship / almost-romance. We all know that Vince clearly pines for the guy but contents himself with just being around for him almost all the time. And we also see that Stuart is clearly dependent on Vince as well given he's the first person that he calls whenever there's a spot of trouble. I appreciated how the show took things to their more logical (and sometimes dire) resolutions based on the events. It's not all that depressing, but it also doesn't tint your view of their world with shades and blinders. Instead we have a rather practical, matter-of-fact representation of their lives and a good taste of what they're experiencing. And in the language of the show, the ending was "a little bit camp", but it still worked for the whole narrative. Queer as Folk has a great story, and one that is the start of this series more than anything else. If you want more pointless drama, you can go back to the US version if that's more to your tastes. Thus the show as a whole gets 4 rather blatant insertion of Davies' Doctor Who mania into the show out of 5.